The Liberal Redneck Manifesto is poised to really put a dent in this mess that landed that creepy moneybag in the White House. I hate being told what to do. Raised hell on my parents, then loafed around partying a long while (known as college), then moved to Atlanta to try to rise above my station. Though I spent my first 17 years in Chicago, adult life has been spent on three years in Louisiana and a dozen in Georgia. As I have no intention of ever moving north of the Mason-Dixon again, we ort consider me a voluntary Southerner. A part of it is: I like living some place where a bunch of folks happen to disagree with me, because I like shooting my mouth off and pushing up against those that would judge me so’s I help them broaden their horizons. Which is to say: I'm a redneck. It’s an ugly word, though people that would rather die than utter the N-word have no trouble using it in public, similar to its close relative, “hillbilly”. First and foremost, being a redneck means you’ve got white skin, which indeed I do. The second criteria is that you don’t have a lot of money, to say the least. These are working class people, like my parents. My public school teacher salary makes me look rich by comparison. Most might say that I can’t be a redneck because I’m disqualified by having too much education and too progressive politics. Y’all are wrong and that’s what I want to discuss today. During my life in the South, I have met many intelligent and kind white people what thinks of themselves as card-carrying Republicans and Christians. I wasn’t born or bred to be either of those things, but it’s weird how, after talking to somebody a long while, you begin to see how much there is in common between you to agree upon. For example: drinking beers is awesome and so’s listening to the sweet sounds of Lynyrd Skynyrd. Everybody in the South can be proud of throwing a good party. We gave Prohibition what for, and on the last day, NASCAR was born. Skeeeew, fast cars are real fun! But in my 14 years down in the deep and dirty, I’ll tell you what: there’s a lot of Southern shame, too. Slavery and segregation, y’all. The stars and bars run up high on the pole by some racists peering through some sheets, y’all. We got major prison over-crowding, substance and spousal abuse problems, and the last decade has seen the worst quality country music ever in history. May Dolly Parton never go to meet Dale Earnhardt. And look, nobody ort be hunting with an automatic. Southerners got loads of common sense, except when it comes to voting against their own interests all the time. Donald Trump is going to be the President of the United States, y’all. I mean, what gives? Everybody’s saying that white evangelicals voted him in, that white women fearing for their working class families voted him in. But I know plenty of liberal rednecks who’re frothing at the mouth as much as I am about this because the South is full of smart, decent people -- as well as a goodly number of folks wanting to get smart and get decent but haven’t had much opportunity to do so because of the color of their skin or the contents of their wallet. If only there was a book we could put in the hands of all these interested, capable people to aid them in doing better. Well, there is: The Liberal Redneck Manifesto, by Trae Crowder, Corey Ryan Forrester and Drew Morgan. Don’t just read it for yourself; be sure to share it around a bunch after church and turn your auntie’s book club on to it. Heck, it’s written by three comedians and is plenty funny enough that you could leave it on the toilet tank so’s your daddy might pick it up for a minute. Each chapter takes the good with the bad in Southern culture -- the pecan pie with the diabetes, if you will. This book celebrates what we do absolutely right, from a killer football tailgate to our fierce loyalties of family. But it also honestly addresses our conflicts and failures, notably rooted in racism and poverty. The South doesn’t have a monopoly on discrimination or cashflow problems, by any means, but that’s no excuse for not helping to make right what we can make right. “Men claiming superiority over women because men make more money than they do is like claiming you’re stronger than a lion that you tranquilized and put in a cage. Sure, you’re in a better spot now -- but how ‘bout you unchain the beast and see what happens?” (229). There’s also a bunch of pretty sweet graphics in this book, including What Wouldn’t Jesus Do and Rebel Flag Replacements. The entire thing is in bite-size chunks, as it’ll be too much meal for some mamaws and papaws to digest all at once. But look, everybody agrees we ort start talking to each other and finding a way past what seems like insurmountable cultural differences, yet nobody knows how we should proceed to actually talk that talk. 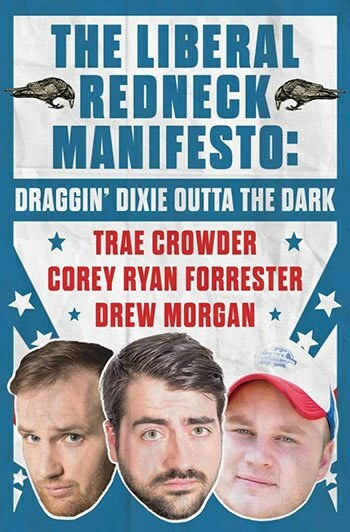 So here comes three comedians who luckily have an earnest belief in the progressive side of things already anyway, and The Liberal Redneck Manifesto is poised to really put a dent in this mess that landed that creepy moneybag in the White House. That man don’t sit right with many a fine Southern figure I’ve met in my time, and it’s high time we heard from some characters who can build an argument and turn a phrase at the same time. No offense to Jeff Foxworthy, but there’s a new game in town. The Liberal Redneck Manifesto is gonna help us get our healing on, y’all. Talk ‘bout rockin’ the vote.